3 Wind/IK is our first day of movement. The Seed that germinated in darkness will now Grow in the Light. Tone 3 is Movement and IK is the Breath of Life and Breath of Spirit. We begin to grow toward a Light of Spirit that has become visible. Our Seed will become the Sprout for a new harvest. Wind/IK resides in the North, the direction Wisdom. The North holds the accumulation of Wisdom from the Creator, from the Elders that came before, and the Wisdom of our own experience. Here the Element of Air represents the mind, our ability to comprehend, and the Gift of Consciousness that makes it possible. This is a day to Honor and Appreciate the Wisdom that was drawn from the Intention of Consciousness by our Elders. The glyph illustrates the portals carved in stone that amplified the sound of the Wind. Wind is the Voice of the Creator and the medium of a Sacred Exchange. 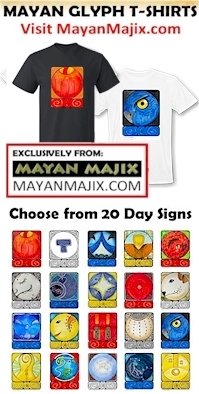 3rd Uinal of Movement – On 2 Crocodile/IMIX we entered the 3rd uinal (20-day cycle) holding the Intention of Movement. The 20-day uinal cycles reflect our movement through the seasons of harvest, providing discernment of the Higher Context of our Intention. The Dream we are now inspired to follow will produce the Fruit of Spirit we bear in the season of harvest. Known in numerology as the Master Teacher, 33 is the most influential of all numbers, indicating selfless devotion to the spiritual progress of humankind. The 33rd parallel was the latitude of Earth, which history records as Human’s circumvention of the globe. The Masons mark the 33rd degree as the Initiation of the Highest Order of Spiritual Wisdom. In “The Wind is my Mother,” Uncle Bear Heart (Marcellus “Bear Heart” Williams) wrote of his experience raised up on the path of the shaman (the path we are undertaking from the Inspiration of Deer/MANIK). He defined Wind as the Gentle Caress of our Mother, a Blessing of Well-Being as the health of Body, and our Mental, Emotional, and Spiritual Health. As we were born, our first Breath of Air was proof of Life. Growing up, Bear Heart was given an assignment, a daily vigil to sit in a field. He became Conscious of the patterns of Wind, the movement of the birds in the sky, and the life around him. He saw the story of how all living things communicate through the Air. He saw the reasons birds take flight, and how other creatures responded to the birds’ movements. He came to know what was happening around him when a flock of birds took off together from the trees. He also came to see how Wind guided their Movement. The Air is our common field of Communication. The Breath we give to it, and the Breath we receive is an exchange we are Connected in as One. With each Breath we are given an opportunity to learn something more. Our spoken words are carried by the Wind in an exchange of ideas. The Wind carried the Spoken Words of Creation. Wind/IK is the environment that always surrounds us, the Element through which we Move and Disseminate our thoughts. The Elders say to make note of the Wind whenever you see it or hear it. What were you thinking? What did you remember? Wind is a Source for the Discernment of Wisdom. A gentle breeze speaks for itself. And, so do the Winds that change the landscape of our life. The sound of Wind rustling in the trees speaks to our Spirit. Turning our Consciousness to the Wind, we Will learn what it means to us. On Tone 3 Wind/IK calls for our first Movement toward the Light. Through an action of movement, whether it be a physical movement or a dissemination of ideas through communication, our Intention draws its first Breath of Life. As we Move so are Elements and Atoms moved around us, creating a new Vibration of Sound. The Vibration will follow its own course of frequency from its own beginning to its own end. Its rhythm and frequency will direct the course of our Dream. From the first step, we’ll be drawn to the next on a wave of Intention. The direction we are taken is determined by the Intention we hold. Intention is Spirit’s means of Movement on Earth. When we are Conscious in the Movement of Intention, so are we Speaking the Words of Love… the Love of the Dream we moved toward. Our Vibrations in the Air express the Love inspired by a Divine Inspiration, and Life created by the Sound of the Creator’s Voice. Within the Element of Air we can draw Healing and Light to the Body. Whenever we need Healing, we can draw a Divine Breath and direct it toward the place of our pain or anxiety. We can see it go there as a Breath of Light. Through the Air, we can send the smoke of our prayers to the Creator. The Cherokee Whirlwind represents the double helix of smoke that rises with our prayers. The Whirlwind was the 13th Dancer, the leader of the 12 who Ascends to lead from the realm of Spirit. Air is the Element of the Wind beneath our own Wings. Today we make an Offering to the North through the Wind. From the Divine Will empowered by Love, our Movement toward a Dream will Express to the Creator the destination of Wisdom we hope to reach. Our Movement is the Offering of a Human response to a Divine Call for Creation. Bear Heart also spoke of allowing the Wind that holds and caresses us to carry us where it will. When we see the Wind changing the landscape of our lives, we can discern the Wind knows where it is going and the change it will bring to our life. The Wind holds the Consciousness of every Divine Thought that is expressed through it, just as Earth’s atmosphere still holds the Breath of our Ancestors. 3 Wind/IK is a good day to be born into a New Life. This Time is given for the Purpose of Creation. Through the Element of Air, a Dream of our own Creation can be Spoken to Life as an Expression of Love. To all my relations, as we make our first Movement of Intention, may we do it with Consciousness of the Tone and Frequency of the Vibration we are bringing to Life. May we conceive the Movement as an Expression of Love to the Creator, our a response to an Inspiration in the Divine Dream we will share. May we offer our Dream up along the double-helix of smoke and let it go to the Mind of the Creator, so that the course of its direction would lead to a Divine End. May we experience the Beauty of Nature in silence, listening for the Sound of the Wind, ready to discern it as a Divine Response. May we Honor the Wisdom that was preserved as our Divine Inheritance. May we offer an Exchange of Love, through an Intention to become Conscious of all we were meant to Know, and of the direction we would be carried by the Wind. May we hear in the Wind the Call to Worship everything that was Created to Live, sharing the Same Breath with the Creator through the Air that surrounds Mother Earth. May we speak the words of Love through our Creation. May we hear the Divine Thoughts carried to us on the Wind. I’m grateful for the Wisdom of Uncle Bear Heart. He is Minisa Crumbo’s Uncle that raised her up in the way he was taught. I’m grateful for the Wisdom of Uncle Bear Heart that Minisa Crumbo passed on to me. I owe a debt of gratitude to Minisa for all the Sacred Ceremonies she’s shared, and the Medicine work she gave her Time and Consciousness to perform on me in the One-on-One. Thank you, Minisa, for the fire you’ve built and tended just for me. I Honor both Minisa and Bear Heart for Gifts that continue to unfold their wisdom – and for their dedication and patience in the time that it takes for me to see. Marcellus “Bear Heart” Williams [1918-2008], born in Okemah, Oklahoma, was a full-blood spiritual leader of the Muskogee-Creek Nation trained in the traditional ways of his tribe. Highly regarded as a healer and counselor, he was also a respected leader of the Native American Church, Sun Danced with both the Northern and Southern Cheyenne people, and was an ordained minister in the American Baptist Church. 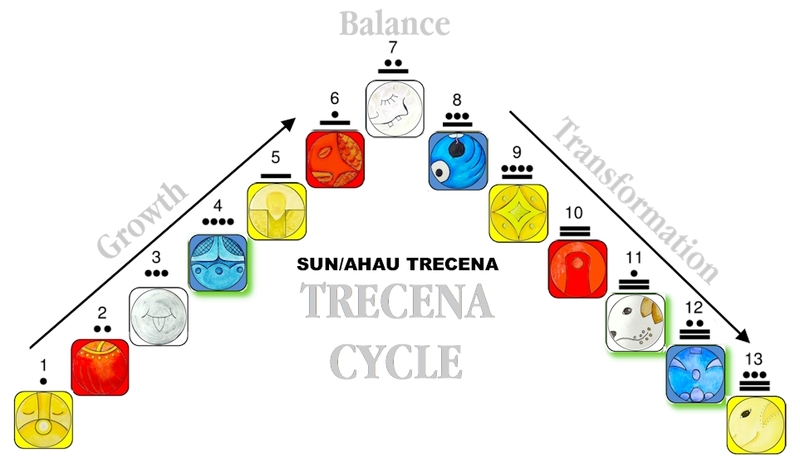 Visit the 13-Day Trecena Guide for a trecena energy forecast, insight on the 3rd Uinal, and daily aspects of the Sun/AHAU trecena. How can I know more of the Uinals? Can you point me to a website with more information about them? Thanks!